San Loco is practically giving away tacos this Sunday in honor of their own 20th anniversary. Cause to celebrate, I say. There are a couple catches before you go completely insane (loco). Limit five (5) per customer. Hard shell beef tacos and bean/rice tacos only. Offer is not valid for delivery service. Tax is not included. Offer available while supplies last. (No funny business). Still a great deal. You can't blame them for the restrictions - you don't make it 20 years in business by giving everything away. 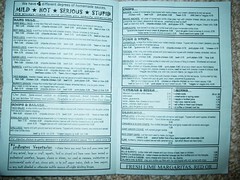 And yes, the restrictions really did say, "No funny business." 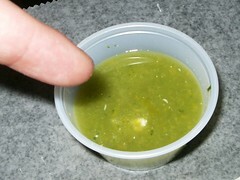 Beware the San Loco stupid sauce. I'd had it before and knew what I was in for. This stuff is hot. When you order it, they yell back to the kitchen, "¡E-e-estupido-o-o-o-o!" Was I stupid for ordering it? Yes. Wednesday, February 01, 2006 by Jonah. Permalink for ¡Estupido! Ron shows how to put down some after-the-bar food at San Loco. Ron Loco! We Got San Loco That Night? Ever the drunk food establishment, San Loco does it's best business after many restaurants close. The clearest memories of this night are provided by digital photograph. 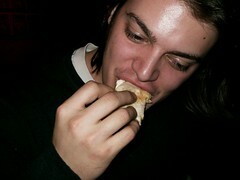 Will, a man truly capable of critiquing food, was not available to comment, because he had no recollection. Thursday, December 29, 2005 by Jonah. Permalink for We Got San Loco That Night? After skating to The Sunburnt Cow on Avenue C, Kristin and I found the bar completely empty. We took it upon ourselves to give them some business. Lots of business. What better to fill bellies than bourbon and Strongbow? 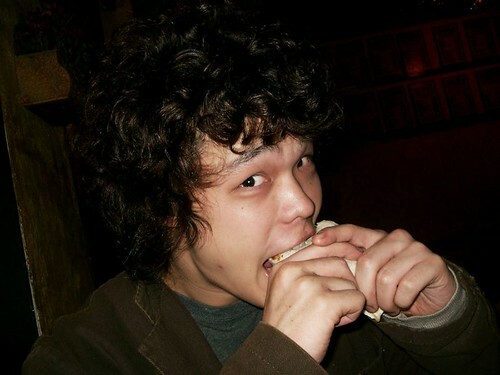 Burritos from San Loco. Catfish burritos. At 2 AM. On Halloween I was Where's Waldo. 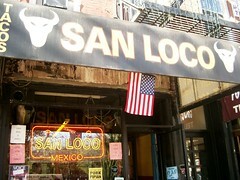 After checking out the parade, I hit San Loco for a chicken burrito. Earlier that night I saw the best costume ever for a couple: Princess and Mario. New York's Halloween parade is not to be missed, nor is the late night fare at San Loco. Unfortunately this was not a planned Burrito Blog expedition, (I only had my camera because it was Halloween) and I did not take notes on the meal. In related news, TJ asked if I was Where's Waldo in real life, moving from place to place. 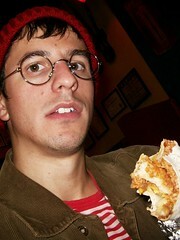 The answer is no, I was Waldo on Halloween, and am Burrito Blog's Lead Burrito Analyst in real life. There are two San Loco locations in NYC's East Village, Avenue A between 9th & 10th (Map), and 2nd Ave between 7th & St. Mark's (Map), plus one more location on the Lower East Side on Stanton between Essex & Ludlow (Map). All three locations deliver, and the LES location serves alcohol. Between the geographic locale and the fact that they're open until 4 or 5 am depending on the day, San Loco has drunk food written all over it. Coupons are available on the official site, though I'm not sure what they're for 'cause I don't have a printer.